About the same amount of atmospheric carbon that goes into creating plants on land goes into the bodies of tiny marine plants known as plankton. When the plants die, bacteria feed on their sinking corpses and return their carbon to the seawater. When plankton sink deep enough before being eaten, the carbon can remain trapped in the deep ocean for centuries. How much of this happens in different regions of the ocean would seem like an academic question, except during an era when humanity is spewing carbon dioxide into the air at record rates. A new study published in the Proceedings of the National Academy of Sciences provides a global picture of the fate of marine carbon, helping confirm the role that polar oceans play in regulating atmospheric carbon. The study found that the polar seas send organic carbon to the deep sea, where it can no longer trap heat from the sun, about five times as efficiently as compared to other parts of the ocean. The pump had been thought to operate at similar strength throughout the oceans, but the new study found a strong regional pattern. The authors find that about 25 percent of organic particles sinking from the surface in the polar oceans reach at least 1 kilometer (0.6 miles) — the depth required for long-term storage in deep waters. Just 5 percent of sinking carbon in the subtropics makes it that far, while the rest is released into shallower water where it can soon rejoin the atmosphere. For the tropics, the figure is about 15 percent. The growth of marine plants at the ocean’s sunlit surface is well-studied, but what happens a mile down is more mysterious. For many years, scientists have put floating sediment traps at different depths to try to learn how deep the particles reach, but the results have been inconclusive. “It’s obviously quite expensive to deploy these traps on a scale that you would need to make global estimates,” Weber said. The new study took a different approach. Researchers looked at phosphate, a nutrient taken in by plankton in the surface and released with carbon when particles decompose. They then used a computer model of ocean currents to determine the depth at which the nutrient is released. They found that, overall, about 15 percent of the carbon in ocean plankton makes it to long-term storage in the deep ocean, which agrees with previous estimates. But the regional pattern came as a surprise. The authors tried to understand why. Temperature could be a factor, since cold water, like refrigerators, will slow decomposition on the way down. But the temperature difference could not fully explain the results. What did explain a range of observations was the size of the organisms that form marine snow. Warm, nutrient-poor subtropical seas act as “marine deserts” where the life that survives is made up of microscopic plankton called picoplankton. 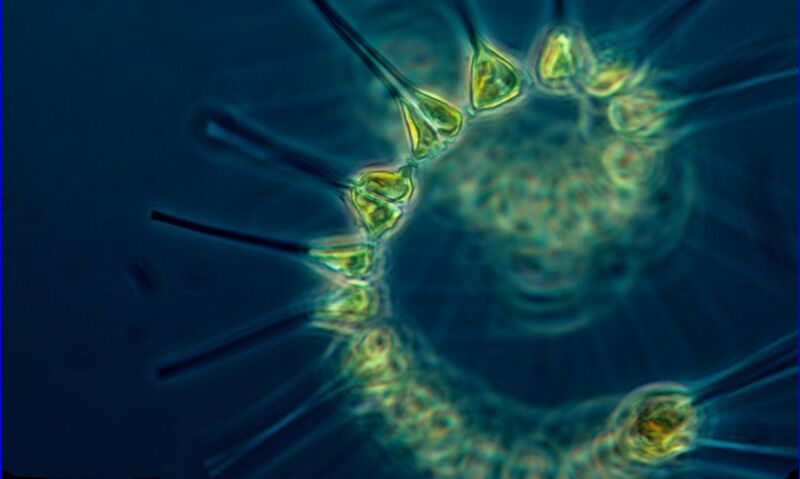 Nutrient-rich polar oceans, and to a lesser degree the equator, can support larger lifeforms—such as self-feeding phytoplankton—that sink more like a proverbial stone. “Simply because they sink faster, these phytoplankton are more likely to reach the deep ocean before being consumed,” Weber said. The research was funded by the Gordon and Betty Moore Foundation. Other co-authors are Washington oceanography postdoctoral researcher Jacob Cram and graduate student Shirley Leung, and Timothy DeVries at the University of California, Santa Barbara.